For a truly dynamic web site, you must take advantage of database integration. This technology allows your website to interact with all the capabilities found in a relational database. Text, pictures, and calculations can all be made to relate and interact with one another. For a quick example of how this works, click here. Crawdad linked an SQL database to HTML using Cold Fusion to create HUD's on-line calulator. 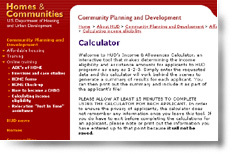 This website performs a one-on-one analysis of user's income levels, to determine eligibility for assistance programs.